A second of my infrared enamels. An hour or so before taking this infrared picture, you would have seen the reeds at the back in the warm yellows and the water in the canal in the cooler blues and purples. Within an hour of dusk the relative heat of the two had switched, and the canal became this artery of gold. 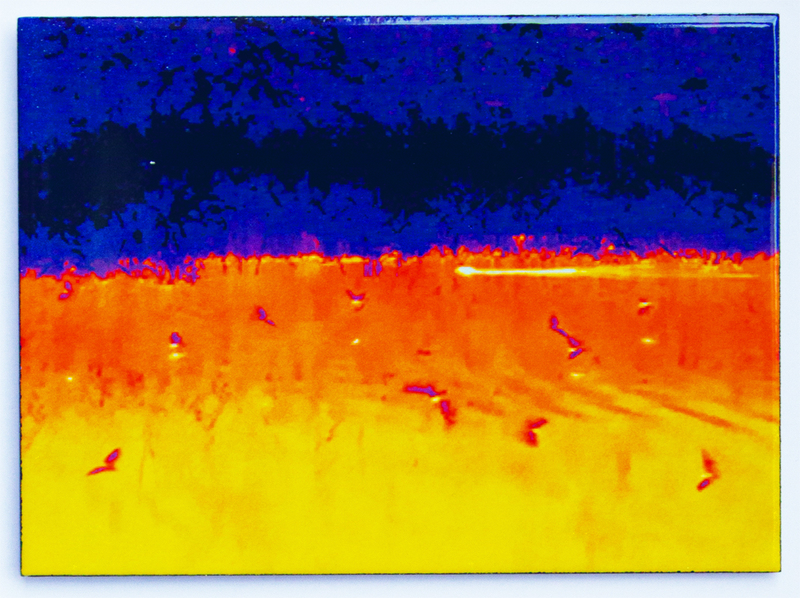 The heat from the bodies of the bats flying low over the canal can be seen reflecting in the waters’ surface, while the white projectile, swimming swiftly from right to left, close to the reeds turned out to be an otter. This is the first time that I have worked with enamel. A small steel plate with coloured powder glass on top, backed to 800°C so that the glass melts into a hard smooth enamel. The image is an infrared portrait of Sue. 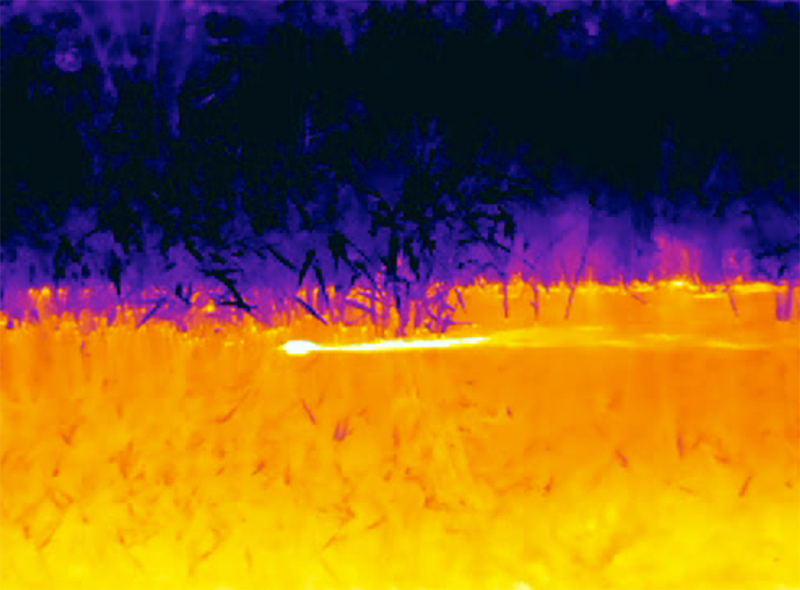 Along with our visual image, the one that everyone can see, we emit a heat image, infrared rays coming from us and then, just like light, reflecting off surrounding surfaces. What is intriguing about infrared portraits is that they are invisible. So here, the surface is made of brushed metal, so when you look into it you see…brushed metal. It is not reflective, not shiny like a mirror, so no visible reflection. 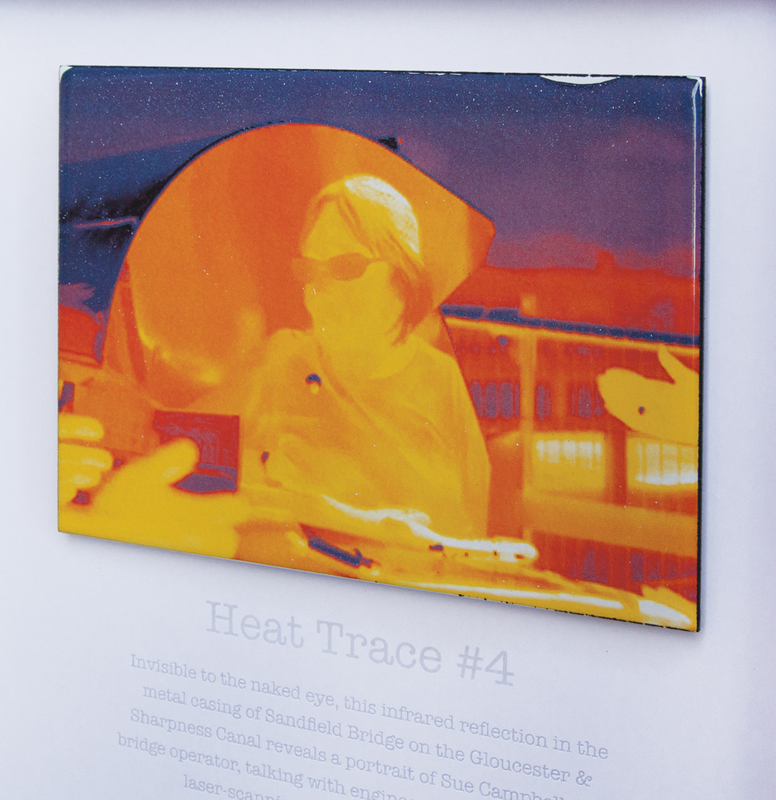 However, turn on the infrared camera and there is an infrared portrait of Sue. She is off to the right of the picture (you can see her hand with a ring on it), talking to Neil who is off to the left of the picture (you can see his hands too), and the camera is looking over Neil’s shoulder, and between them the reflection of Sue in the brushed metal. I like the idea that as you walk down the street invisible images of yourself are appearing in windows, along the sides of cars, in street signs quite undetected by the naked eye. I have just produced a series of enamels for the Canals and River Trust in Gloucester, part of a project called Navigable Waters that has been curated and produced by artNucleus with Stroud Valleys Artspace.. There we were, about 11pm at night, filming bats skimming over the canal when suddenly a white something entered the frame (white because I was using the infrared camera set to show warm objects in white). Reminiscent of Nessie, it motored from right to left, on up the canal, at quite a speed with a fan-shaped wake trailing behind. Chasing along the towpath in the dark with the camera image as my only guide, Mark (ecologist) was ahead of me with torch in hand following my erratic directions trying to catch the animal in the spotlight to identify it, all thoughts of bats were lost, Well, finally he did catch up with it and identified it as a rare sighting of an otter. And the name, ah, well, we spotted it on the Droitwich canal, you see! Pity Neil that you had left 10 mins before! Yesterday was spent with the the senior M&E (mechanical and electrical) engineer for the Canal & River Trust, trying to get my head around the control systems, feedback loops, electrical and mechanical circuits that lie behind the seemingly natural flow of water through the canals. The Gloucester to Sharpness Canal, all 16 miles of it, doubles as a reservoir for North Bristol, so keeping the it full is vital not just to the boats. Juggling the various inflows (rivers, streams, etc.) and balancing these with the outflows (whenever the big lock at Sharpness is emptied) is a 24/7 job. The canals themselves are the visible circuit, the gravity-driven flow of water through locks part of their charm, but underneath this lies a parallel circuit of electrical systems that monitor, adjust, respond, balancing, predicting, preempting. I am looking to reveal this in some way, this parallel world. 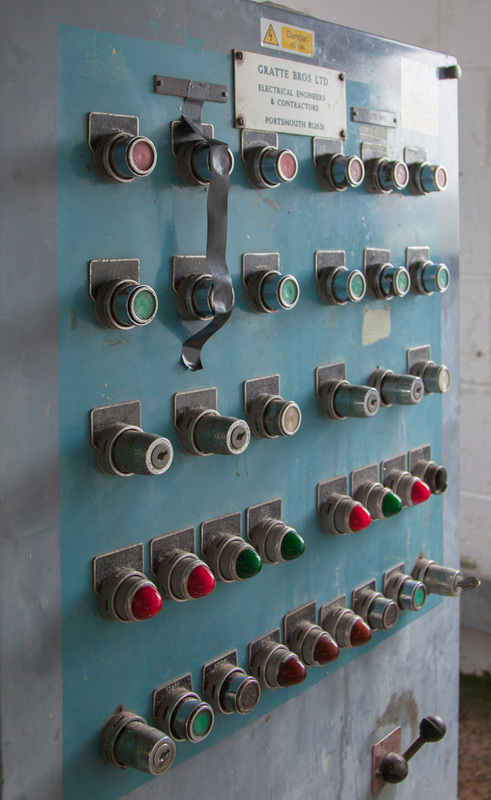 In the meantime, here are some chunky buttons and flashing lights for operating the massive lock gates that open onto the tidal Severn at Sharpness. Thanks Neil for yesterday’s tour and our discussion about drawing, technical and artistic, something I want to come back to. Today has been spent along the Gloucester & Sharpness Canal researching for a project for the Canal & River Trust in Gloucester. The canals are a fascinating mix of engineering and nature, and the boundary between these two is often not so clear: as when badgers tunnel into the bank, piercing the clay lining of the canal causing it to drain out, or when invasive Zebra Mussels growing on the sluices build up so much that the sluice will not longer close – re-engineered by nature. 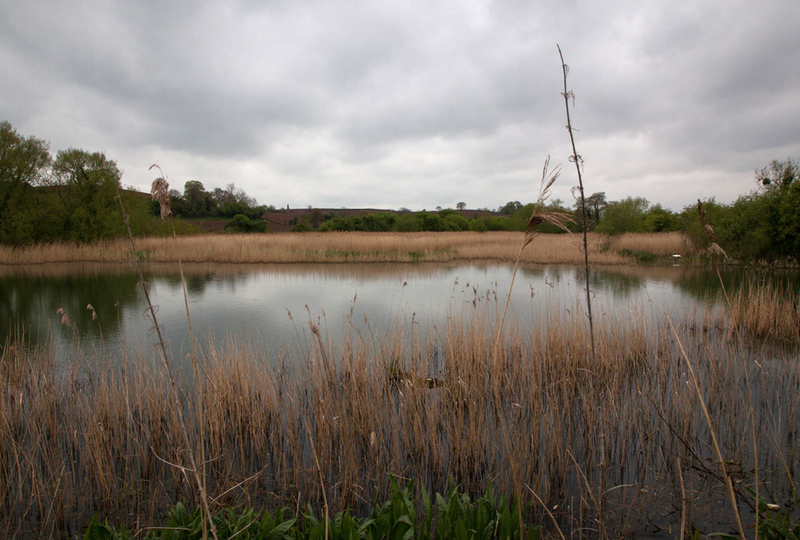 It is the overlap between the engineered and the natural that interests me here, at the Purton timber pools. Timber brought into Sharpness dock used to be stored here before being lashed together and towed up the canal to Gloucester, or so I have been told. Today, these canal sidings have been overgrown by water reeds, leaving a little open water near the entrance. A beautiful spot. Thanks Laura for showing me around today: great crested grebes, badgers, zebra mussels, water voles, bats and more. It is pleasing to have the chance to make some work in my home city. 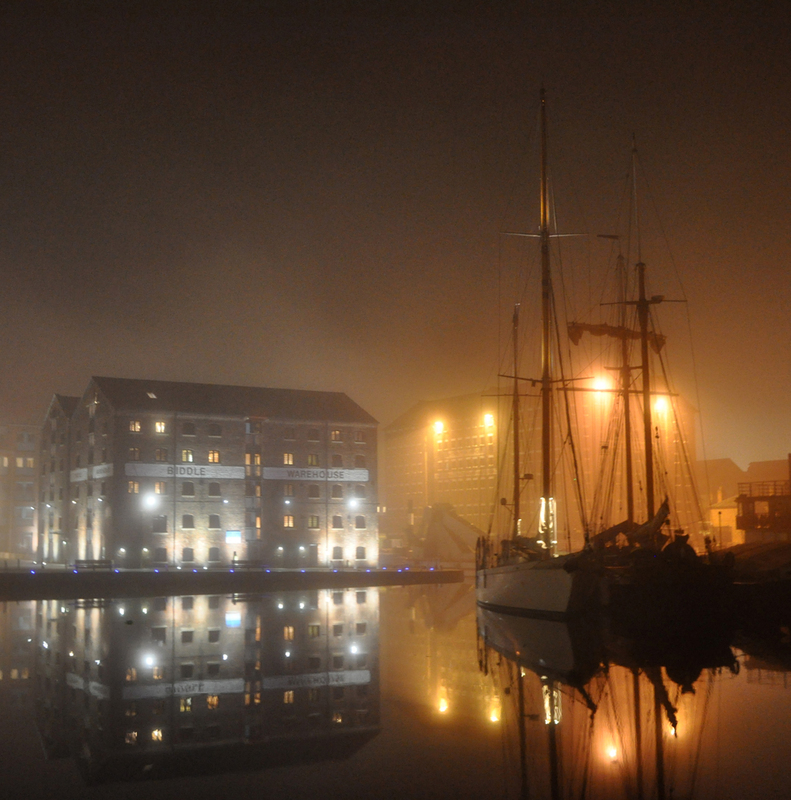 I am just starting as lead artist on a project for the Canal & River Trust in Gloucester Docks, in association with SVA. Working with three other artists, visual artist Emily Joy, poet and writer Ralph Hoyte and artist/model maker/animator Colin Higginson, we will be making new work for the CRT offices in Gloucester over the next three months. Each artist will be paired with a CRT ‘ambassador’, someone who is especially knowledgeable or enthusiastic about a particular part of the waterways or the collection in the Waterways Museum. (The key here is navigation: a waterway has to be navigable to be part of the CRT network, so can include canals as well as rivers.) I will keep you posted as to how it goes. Laura, looking forward to meeting up at the beginning of April to set the project in motion.